Reminisce with these romantic fragrances. The soft, sweet scent of springtime can lead to a stolen kiss under a starry night. Romance fills the air, a fresh-cut arrangement sits in the moonlight on a Victorian veranda, and Southern lace sways softly in the clean night air, bringing with it hints of lightly scented florals and citrus. Live in an innocent lovers’ paradise of days gone by. Rich citrus floral with a woody base. Top notes: lemon, orange mandarin, and tangelo. Middle notes: jasmine, apple, lily of the valley, and carnation. 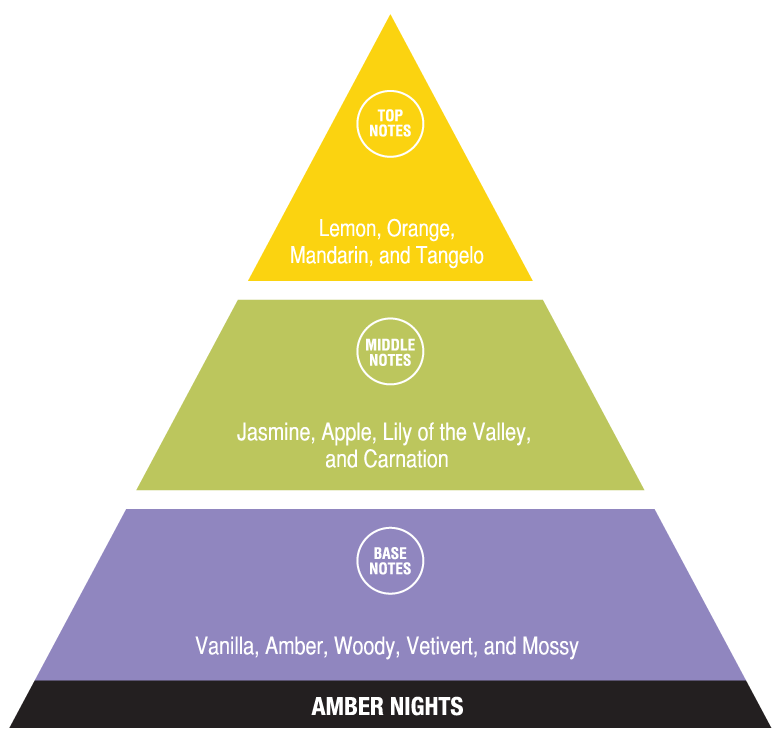 Base notes: vanilla, amber, woody, vetivert, and moss. Unique floral blend with a hint of sweet fruit. Top notes: clean and fresh. Middle notes: blend of mixed fruity floral nuances. Base notes: soft, sweet, and musky. Rich, delicate floral bouquet picked from an aromatic Victorian garden. Top notes: clean and fresh with hint of spice. Middle notes: mixed fruit and florals with hint of lavender and balsam. Base notes: soft, sweet, and musky with touch of spice and sandalwood. A garden of lavender and herbs. Top notes: fresh and clean camphoraceous. Middle notes: smooth lavender with leafy nuances. Base notes: woody with warm and musky floral undertones. An aromatic flower garden with hints of fruit and herbs. Top notes: fresh and clean with hint of lemon. Middle notes: mixed fruit with floral nuances. Base notes: sweet and peppery with musky undertones. A backdrop of spring flowers with a blend of citrus. Top notes: Clean and fresh with touch of lemon. Base notes: sweet and musky with herbaceous undertones and hint of floral. A fresh, clean country garden of intense greens and florals. Top notes: clean and cooling. Middle notes: intense green with mixed, fruity blend of florals. 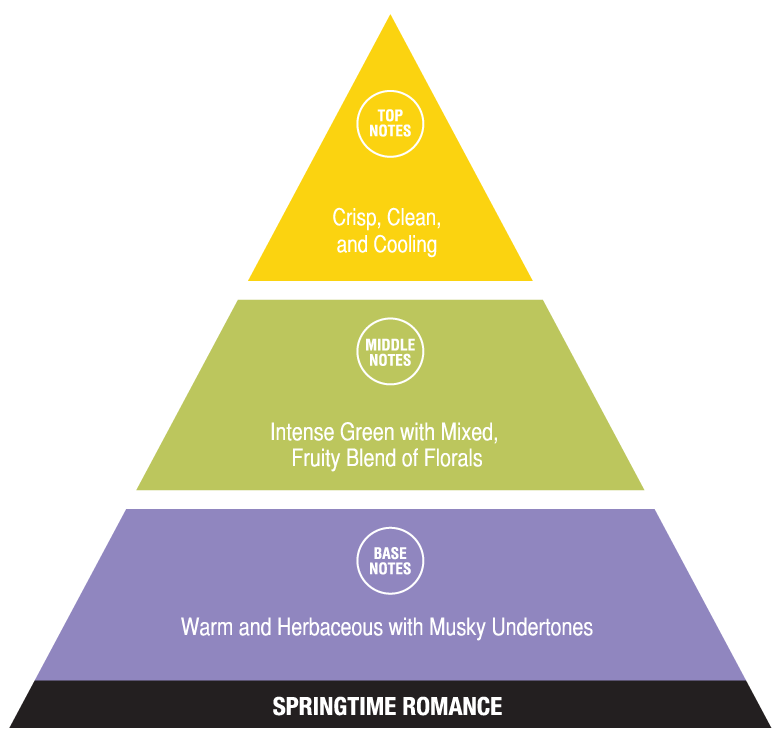 Base notes: warm herbaceous with musky undertones. Rich florals with citrus on a bed of fresh, silky moss. Top notes: Crisp, clean florals with hint of zest. Middle notes: Floral blend infused with mint and citrus nuances. Base notes: Soft, sweet, and musky with leafy garden undertones. Outdoorsy mix of soft lavender and soft vanilla. Top notes: fresh, spicy and warm. Middle notes: woody nuances and lavender blossoms with hint of pine. Base notes: spicy, floral undertones with smooth sandalwood.